Full details and photos to be added very soon. This board has been well used but there is still plenty of use left in it. I can throw in a pair of Burton lace up snowboarding boots for free (beige/grey colour) if interested. The board has been waxed and tuned, so it's ready to go. Condition is Used. Colour Black. With original box. Locking Slap Ratchet Aluminum Buckles - Give you the option to easily get in and our of your bindings any which way you like. Aluminum design also reduces friction and weight. Flow Snowboard Bindings for size 11. I also have a pair of Boots for sale. You can adjust the fit with the LSR buckles which you can tighten or loosen at will. Simply unlock the high back, recline, step in and then lock back to its usual position. Super quick, and super simple! Snowboard -Zen Flow. Condition is Used. Dispatched with Other Courier (3 to 5 days). Morphan Flow Snowboard Boots. Men's. Size 9.5. Used. The Flow 2018 Micron Mini kids snowboard is the ideal to get your little ones on the slopes at a young age. Kid's All mountain snowboard, perfect for learning the basics! Tru Flex Core - Durable and forgiving for super easy landings. The 2019 Flow Five Fusion snowboard bindings are an accessible forgiving binding for progressing riders. You can adjust the fit with the LSR buckles which you can tighten or loosen at will. Simply unlock the high back, recline, step in and then lock back to its usual position. A great all-mountain boot with a perfect fit that conforms to any rider and any style, the Lotus blends high-tech function and forgiving flex with a great price. Flow QuickFit™ Technology. Speed lace closure for liner. With a soft flex it will feel forgiving for kids to handle all mountain, park pursuits. EZ-Rock - Subtle reverse camber profile with a convex base between the bindings, and camber starting before the bindings to provide stability. No worries, Flow's Fusion Strap Convert Kit has got all the options covered. Excellent choice! We do not hang about and neither does your parcel! Kit Contains Do a Google search for"Absolute-Snow" to find out more. Black Flow Onyx Coiler Womens Snowboard Boots size UK 5.5. Bought last year and used for one holiday only. They look like new - no cratches. Bought for £119 last year and used for one holiday only. Looks like new - no marks. They are very light and comfortable snowboarding boots with Boa lacing system, which makes them easy to put on and off. The boots are in the original box. From smoke and pet free home. BOA H3 Lace Version. Micro Articulating Instep Flex. We will always endeavor to ensure you receive the parcel as soon as possible. If you do not have these details available then pass on as much information as possible on a covering letter. Flow Era Snowboard. Condition is New. EZ-Rock - A hybrid of very subtle reverse camber profile with a convex base between the bindings, and camber under the bindings provide unparalleled stability. This makes pressing easy and improves agility no matter where you place your bindings. This snowboard is not designed to have binding of any type mounted on it. The ideal snowboard to start riding sideways on! Biaxial Fibre glass - A Biaxial layup provides a smooth consistent flex, as well as being more forgiving with sketchy landings. Great for riders looking to feel good and have fun on the mountain, it also features our Active Strap Technology for maximum convenience. FUSE FEELS GREAT, FUN TO RIDE. Flow Rush ABT Freestyle snowboard. Top of the range board. Has silicone insert technology in the middle that wrinkles when going over half pipes etc to keep you on. Its in good condition, has a few small chips as can be expected - easily repaired and nothing major(see pics). Ive not used it that much as I got a back injury in 2016 which is what is forcing a very reluctant sale. Its not been used in well over a year. Maybe used for about 20 hours in total. Please note, the bindings arent included in the sale. This is for the board only. Please see my other listing for the matching bindings. With a soft flex it will feel forgiving for them to handle all mountain, park pursuits. This all mountain, freestyle board carves great and is capable of hitting the park so your kids will have fun anywhere on the mountain while learning to progress on an excellent snowboard. NX2 PRECISION DESIGN, ALL-MOUNTAIN VERSATILITY. 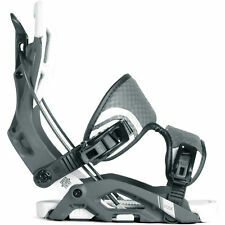 The NX2 is for all-mountain riders needing a stiff, responsive binding with lots of support. Flow Vector Snowboarding Boots Size UK 10, 44.5 EU. Condition is great, almost like new. Only used them a few time. Feel free to contact me if you have any questions. The 2019 Flow NX2 Fusion snowboard binding is a great choice if you are looking for a super versatile all mountain binding! The middle section of the highback has added ATM.8 support for added comfort when flexing. Forgiving and fun the Haylo is a great binding for any rider who's looking to master the slope! You can adjust the fit with the LSR buckles which you can tighten or loosen at will. Simply unlock the high back, recline, step in and then lock back to its usual position. Great pair of Flow Boots, BOA system for easy on and off. Unused and ready to go! Flows 2019 Fuse GT Fusion snowboard bindings are one of the highlights of the entire range. A perfect all around freestyle binding which also can be used for recreational riding all over the mountain. The boards forgiving, catch free ride will help adapt to the changes in the snow keeping you stable and comfortable. The Flat-Rock profile of this ladies snowboard will provide lots of stability, reduces chatter and makes initiating turns quick and easy. The Stout snowboard is an excellent all-mountain board for those looking for a wider option. With lot's of pop, this tech-loaded board is very playful and forgiving, making it great for all-round riding.